There are several processes for making magnets, but the most common method is called Powder Metallurgy. In this process, a suitable composition is pulverized into fine powder, compacted and heated to cause densification via “liquid phase sintering”. Therefore, these magnets are most often called sintered magnets. Ferrite, Samarium Cobalt (SmCo) and neodymium-iron-boron (neo) magnets are all made by this method. Unlike ferrite, which is a ceramic material, all of the rare earth magnets are metal alloys. Suitable raw materials are melted under vacuum or inert gas in an induction melting furnace. The molten alloy is either poured into a mold, onto a chill plate, or processed in a strip caster – a device that forms a thin, continuous metal strip. These cured metal “chunks” are crushed and pulverized to form a fine powder ranging from 3 to 7 microns in diameter. This very fine powder is chemically reactive, capably of igniting spontaneously in air and therefore must be protected from exposure to oxygen. There are several methods for compacting the powder and they all involve aligning the particles so that in the finished part all the magnetic regions are pointing in a prescribed direction. The first method is called axial or transverse pressing. This is where powder is placed into a cavity in a tool on the press and punches enter the tool to compress the powder. Just prior to compaction, an aligning field is applied. The compaction “freezes-in” this alignment. In axial (parallel) pressing, the aligning field is parallel to the direction of compaction. In transverse (perpendicular) pressing, the field is perpendicular to the compaction pressure. Because the small powder particles are elongated in the direction of magnetic alignment, transverse pressing yields better alignment, thus a higher energy product. Compacting powder in hydraulic or mechanical presses limits the shape to simple cross-sections that can be pushed out of the die cavity. A second compaction method is called isostatic pressing wherein a flexible container is filled with powder, the container is sealed, an aligning field is applied, and the container is placed into the isostatic press. Using a fluid, either hydraulic fluid or water, pressure is applied to the outside of the sealed container, compacting it equally on all sides. The main advantages to making magnet blocks via isostatic pressing is that very large blocks can be made – frequently up to 100 x 100 x 250 mm and since pressure is applied equally on all sides, the powder remains in good alignment producing the highest possible energy product. Pressed parts are packaged in “boats” for loading into a vacuum sintering furnace. The particular temperatures and presence of vacuum or inert gas is specific to the type and grade of magnet being produced. Both rare earth materials are heated to a sintering temperature and allowed to densify. SmCo has the additional requirement of a “solutionizing” treatment after sintering. After reaching room temperature, both materials are given a lower temperature tempering heat treatment. During sintering, the magnets shrink about 15-20% linearly. Completed magnets have a rough surface and only approximate dimensions. They also exhibit no external magnetic field. Sintered magnets receive some degree of machining which can range from grinding them smooth and parallel, OD or ID grinding, or slicing block magnets into smaller parts. 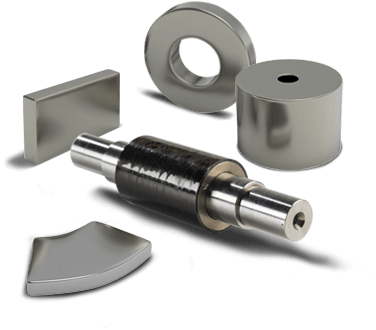 The magnet material is both brittle and very hard (Rockwell C 57 to 61) and requires diamond wheels for slicing and diamond or special abrasive wheels for grinding. Slicing can be performed with excellent precision often eliminating the need for subsequent grinding. All of these processes must be conducted very carefully to minimize chipping and cracking. In some cases, the final magnet shape is conducive to processing with a shaped diamond grinding wheel such as arcs and bread loafs. Product in approximate final shape is fed past the grinding wheel which provides the precise dimensions. For lower volume manufacturing of these complex shapes, EDM machining is commonly used. Simple two-dimensional profiles, EDM is faster while more complex shapes using 3-5 axis machines run slower. Cylindrical parts may be pressed-to-shape, usually axially, or core-drilled from block stock material. These longer cylinders, either solid or with an ID, can later be sliced to form thin washer-shaped magnets. For large volume manufacture, typically 5,000 or more pieces, it is usually more economical to make tooling and produce to shape. For short-runs or for specific properties, it may be preferred to machine magnets from block. When pressing-to-shape, material scrap, such as grind swarf is minimized. Order quantity, part shape, size and complexity will all contribute to the decision as to which manufacturing method is preferable. Delivery time will also affect the decision as making limited quantities from stock blocks is likely faster than ordering tooling for press-to-shape parts. Costing these options is not always straight-forward. It is recommended to contact us to discuss options. Although intricate magnet shapes can be produced from these alloys, the materials are best suited for simpler shapes. Holes, large chamfers or slots are more costly to produce. Tolerances are more difficult to hold on more complex shapes which are likely to result in flux field variations and potential physical stressing of the part in an assembly. Machined magnets will have sharp edges which are prone to chipping. 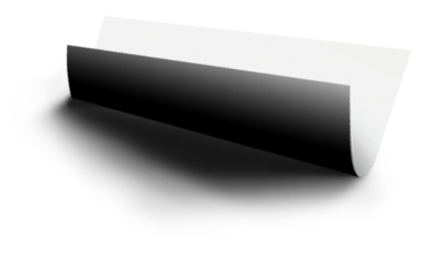 Coating around a sharp edge is also problematic. The most common method for reducing the sharpness is a vibratory hone, often called vibratory tumbling and done in an abrasive media. The specified rounding of the edge depends upon subsequent processing and handling requirements but is most often 0.005” to 0.015” (0.127 to 0.38 mm) radius. 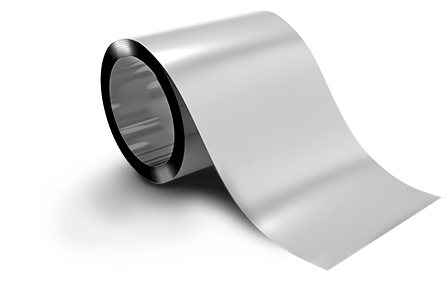 Neo magnets, which are prone to rusting or reacting chemically, are almost always coated. Samarium cobalt is naturally more corrosion resistant than neo, but does, on occasion benefit from coating. The most common protective coatings include dry-sprayed epoxy, e-coat (epoxy), electrolytic nickel, aluminum IVD, and combinations of these coatings. Magnets can also be coated with conversion coatings such as zinc, iron or manganese phosphates and chromates. Conversion coatings are generally adequate for temporary protection and can form an under-layer for epoxy coating or an over layer to enhance protection from aluminum IVD. After the manufacturing is completed, the magnet requires “charging” to produce an external magnetic field. This can be accomplished in a solenoid – a hollow cylinder into which various magnet sizes and shapes can be placed – or with fixtures designed to impart unique magnetic patterns. It is also possible to magnetize large assemblies to avoid handling and assembling these powerful magnets in their magnetized condition. The magnetizing field requirements are substantial. This, as many other aspects of magnet selection, should be discussed with our engineering and production team. In some instances magnets will require stabilization or calibration. Stabilization is a process of pre-treating the magnets, in or out of an assembly, so that subsequent use will not result in additional loss of flux output. Calibration is performed to narrow the performance output range of a group of magnets. These processes require treating in an oven at elevated temperature or reverse pulsing in a magnetizer at fields below full knock-down power. There are several factors that affect thermal stabilization and it is important that this process is controlled very carefully to ensure proper final product performance.